During my early youth I held many short but interesting jobs. One such job began in June of 1974. I was commissioned by a firm in New Orleans to travel with all hast possible to Cairo, Egypt and meet with a crew I would supervise removing scuttled ships from the Suez Canal. This was my first experience with Middle-Eastern/North African culture. Room service had brought dinner to my room and set a small table for me on the balcony as I sat watching a full moon shine on the pyramids of Giza. After dinner and even though it was quite late and knowing the early morning would find me driving to Port Said I ventured downstairs to the night club of the hotel. I stationed myself at a table near the dance floor of the night club of this very old hotel. This was not just any hotel, it was “The Shepheard Hotel”. The very “Shepheard Hotel” that Sir Howard Carter and company used as their base as they set forth on their discovery of “The Valley of The Kings” and “King Tut’s Tomb”. This was a hotel steeped in tradition, myth and lore. This was a hotel worthy of the show I was about to experience. The waiter delivered a gin & tonic to me as three men in white tunics with red fez’s on their heads began to play the drum know as “dumbek”. The rhythm of the drums was hypnotic and when the belly dancer came out my Egyptian Hypnotic Trance deepened and elevated my sense of this beautiful art. I stayed and watched for what seemed like only a few minutes but it must have been hours. I sat transfixed and motionless but thrilled. After the show I went back to my room and watched as the full moon dipped below the Great Pyramid. The night had been magical and I was sure I would never experience anything at this level again in my life. In January of this year, 2008; I went to a club in Ocean Beach, “Portugalia”. 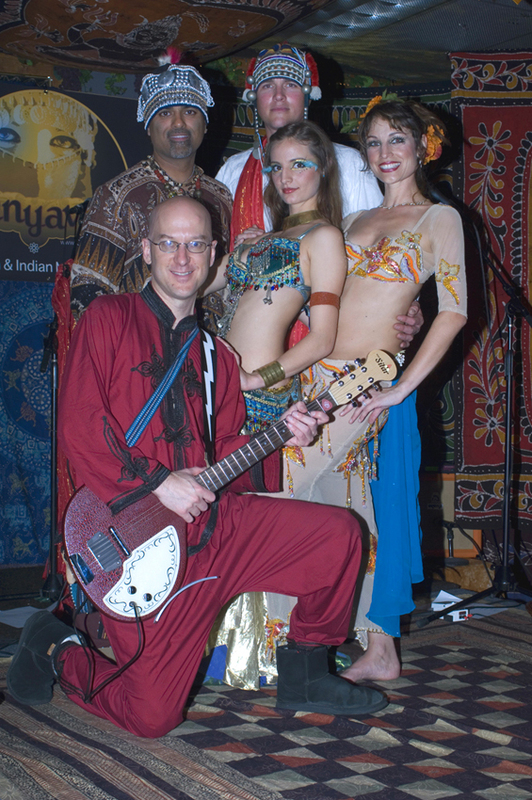 The headline act was a band called Danyavaad with the dance troupe “The Shimmy Sisters”. As I sat back and readied myself for the show, I was stunned to hear the hypnotic rhythm of a lone “dumbek” begin. All the conversations in the room ceased by the third stroke of the drum’s head. The night belonged to the performers and a beautiful experience belonged to everyone enjoying the show. After a few minutes of drum, sitar and bass music “Leilainia” made her entrance. She was then joined by her sister (yes they are sisters and both stunning in their beauty) “Adelaide”. I had seen belly dancers in most of the major cities of Egypt; Cairo, Alexandria, Port Said and Ismialia. My expectations were extremely high. My expectations were exceeded by “The Shimmy Sisters”. Adelaide and Leilainia combined with Danyavaad make up what is by far the best Middle Eastern influenced ensemble I have ever experienced. Danyavaad is a small and simple in concept musical group consisting of an electric bass, “bumbek” (a North African drum akin to the “conga” that has been used in Latin American music for years), the electric sitar and vocals by all three. Each musician of this group could be a “headliner” with any other band. But these three have surrendered their abilities and talents to the group to create original music and a performance that is greater than the sum of their contributions. While the music performed by “Danyavaad” would, in and of itself, justify the show and leave awed, they are joined by “The Shimmy Sisters”. 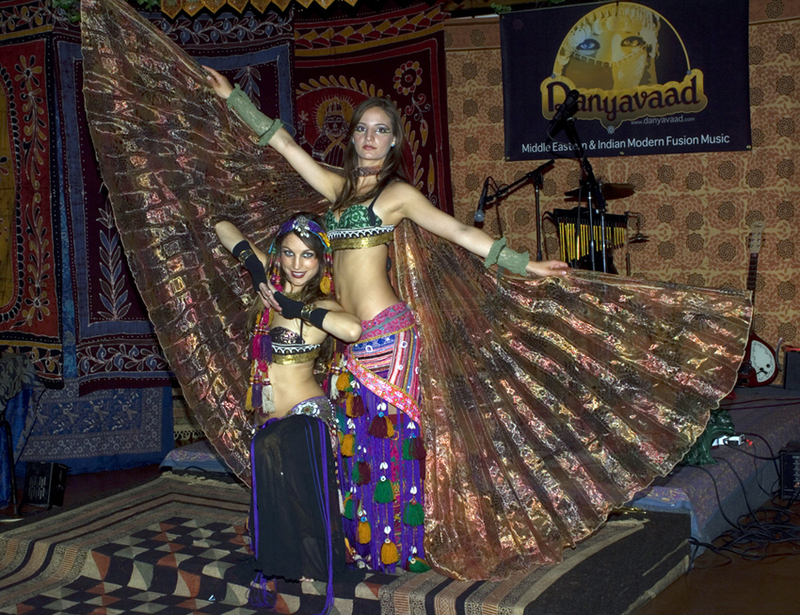 These (actual sisters) have familial Middle Eastern origins and have been dancing all their lives. These ladies are polished dancers and masters at their chosen art. During the show the girls go through multiple costume changes and themes of dance with candles, veils, and snakes. But my favorite are the swords because of the great degree of difficulty within the act. When both ladies have ascended the stage a spell is cast over the audience and you are willingly held in this spell they have cast. Not wanting to be released and not wanting to the show to end. The ending of the show is brilliant, members of the audience are asked, encouraged, and even conscripted to joint in the dancing on stage or if you have an instrument with you, joint the band. This becoming part of the show is really the only way you could allow the show to end. Danyavaad and “The Shimmy Sisters” is not something you want to see once (even though everyone should experience the show at least once) you will as I do, want to see the show as often as you can. They perform on the second Thursday of every month at “Portugalia” on the 4800 block of Newport Ave. in Ocean Beach. I will see you there, I now never miss a show.